It's not just the fares that have increased - so has the size of tickets issued by conductors - a return ticket is now 15 inches long! 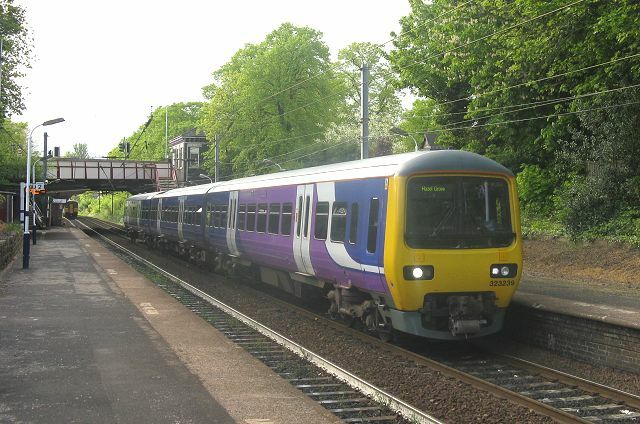 Annoyingly, Northern Railway's off-peak fares within Greater Manchester, already increased in September 2016, were hiked up again from 2 January, meaning that an Off-peak return to Manchester has risen from £3.50 to £4.50 since summer 2016, on top of the evening peak restrictions imposed in 2014. Northern say that this is to 'bring them into line with other areas.' This will mean that if you are travelling to Manchester and back five times (or more) in a week, even if all your travel is off-peak times, it will be cheaper to buy a Weekly Season ticket. Engineering work for the 'Ordsall Chord' is making a big impression on local rail services this Christmas and New Year, in addition to the usual total closure on Christmas Day and Boxing Day and early finishes on Christmas Eve and New Year's Eve, there will be no trains continuing towards the Bolton and Newton-le-Willows routes across the whole period. (Some trains will run from from Manchester Victoria. You are strongly recommended to check the National Rail Website, espcially since a temporary timetable for our services has not been provided, but a summary (the best we can do but may be wrong!) follows. Note: Trains terminating / starting at Oxford Road use Platform 1 there: this has no access only by stairs, with no access to the lift. Travellers to Deansgate can use the Metrolink tram from Piccadilly to Deansgate-Castlefield, and for Salford Crescent and beyond you can go to Manchester Victoria by tram. Saturday 24th: Trains will run at normal times but those that normally go beyond Oxford Road will terminate there and return from there at usual times. Last trains from Davenport to Manchester 21:08, from Manchester Piccadilly 19:49. 25th and 26th: no trains anywhere in our area. No Stagecoach buses in our area on 25th either. On Boxing Day, 26 December. Bus 192 along the A6 to Manchester will be running until approximately 20:30. See the Stagecoach website for details of routes which will operate. Metrolink trams will be running a Sunday service. Monday 27 December to Friday 30 September: Trains call at Davenport more or less as normal, but nearly all will terminate and start from Manchester Piccadilly. Oxford Road station is open and can be reached at some times of day by changing at Stockport to a Liverpool service. Saturday 31 December: Trains call at Davenport more or less as normal, but most will terminate and start from Manchester Piccadilly. Last trains from Davenport to Manchester 21:08, from Manchester Piccadilly 19:49. Sunday 1 January: Trains call at Davenport as normal Sunday, but most will terminate and start from Manchester Piccadilly. Monday 2 January: Trains call at Davenport more or less as normal, but nearly all will terminate and start from Manchester Piccadilly. Tuesday 3 January: Normal service resumes. The Friends of Cale Green Park are throwing their annual Christmas shindig with heaps of family-friendly festive entertainment from 12.30pm to 3pm. Kids can enjoy donkey rides, a splat the snowball challenge and visit Santa in his bowling green hut grotto, and there'll also be performances from the Elmfield Brass band and Cale Green Clog Dancers, a hog roast, hot dogs, homemade cakes and ice cream. Entry is free. The Carllion company, who are now contracted by Northern Railway to maintain the stations in our area, have applied some supposedly-fatal treatment to the Japanese Knotweed infesttation which has been plaguing the station for some years, and threatening to spread to the gardens behind. Let's hope that it has more effect than attempts by previous administrations, as its presence is a major deterrent to any expansion of our Station Friends' gardens. 11 December sees the official end of 'leaves on the line' and a reversion to 'normal' departure times of trains from Stockport. The new timetable seems very similar to the Summer version. All the new timetables can be downloaded in PDF format from the Northern website. A steam-hauled excursion was to pass through Davenport on Saturday 17 September on the way from Preston to Buxton. Expected time through Davenport was about 10:30. Unfortunately it seems that no steam locomotive was available, and the train passed Davenport behind a diesel loco. The result of this is that a Davenport - Manchester Central Zone off-peak ticket now costs £4.00, from £3.50. The 'anytime' return ticket remains at £5.90, whilst the off-peak single seems to have disappeared, with only an 'anytime' version of a single available, at £3.70. One result of this is that if you travel six days per week, even if your journeys are all in off-peak, it is cheaper to buy a seven-day season ticket (valid at all times) at £21.70. To Stockport the Off-Peak day return is now £2.20. Looking ahead we have just embarked on a £1 billion, four-year improvement programme at Northern. Customers in the Manchester area will see new and improved trains, with more capacity and more services that will deliver a better travel experience. They have also promised to reduce their annual subsidy requirement by over £100 million. At the moment there seems to be very little for us in the proposed improvements, except possibly a more frequent Sunday service. The new trains will be used on services elsewhere, and our basic train frequency will still be half-hourly. On 12 September we travelled on the 16:50 train from Manchester to Hazel Grove, which was running 8 minutes late. This train is one of the two extra trains provided in the evening peak, and on arrival at Hazel Grove it is timetabled to travel 'empty stock' to Stockport, whence it turns round and becomes a train to Chester. At Hazel Grove, we arrived at 17:28 and noted on the opposite platform 2 a large group of passengers who had been informed that their 17:35 service to Manchester and beyond had been cancelled. Perhaps they could have been carried to Stockport by the train that was standing in platform 1, to catch other trains to Manchester? No, off it went empty to Stockport. Perhaps the conductor signs off-duty at Hazel Grove, but it seems a shame that such an obvious chance to help customers was missed. The useful walking and cycling route across Mirrlees Fields between Crossfield Grove and Bramhall Moor Lane (Path 124S) is currently subject to a Footpath Closure Order for a 'maximum of six months' for safety reasons while building work progresses on the old Mirrlees factory site. The alternative route map posted near the route and on the Council website shows am alternative route which ignores the fact that it is possible to pass through Stepping Hill Hospital grounds via the gate at the end of Ripley Avenue. It is also incorrect in that the part of the path from Crossfield Grove to the corner of the factory site, and then the route (Footpath 126S) across the fields to Kinross Avenue is still available, at least at the time of writing. However it is to be hoped that the route to Bramhall Moor Lane is re-opened as soon as possible, as it forms a very safe traffic-free route for cyclists and walkers. The work relating to the future timetable changes is well under way. As part of this process, the operations and planning team are working through Arriva's winning bid, of which their response to DfT's train service specification is included. While doing that we are also identifying what else is possible, in terms of enhancing services further where it is commercially and operationally feasible. We are, as you might expect, receiving various external enquiries like yours from stakeholders across the network. In terms of providing a detailed response, and indeed identifying where additional services may be incorporated into the overall timetable changes, we will be undertaking external briefings later this year. By liaising with Transport for Greater Manchester and the Community Rail Partnership, there will be opportunities for groups such as yours to feed into this process, ensuring that your aspirations are captured and explored. So there we are (or not). They have signed up for something but don't yet know yet how to do it. We've also been in contact about the dreaded Japanese Knotweed on the Buxton-bound platform, which is blooming just as much as before it was treated last year, and spreading towards our little station garden. Northern's contractors are to visit. 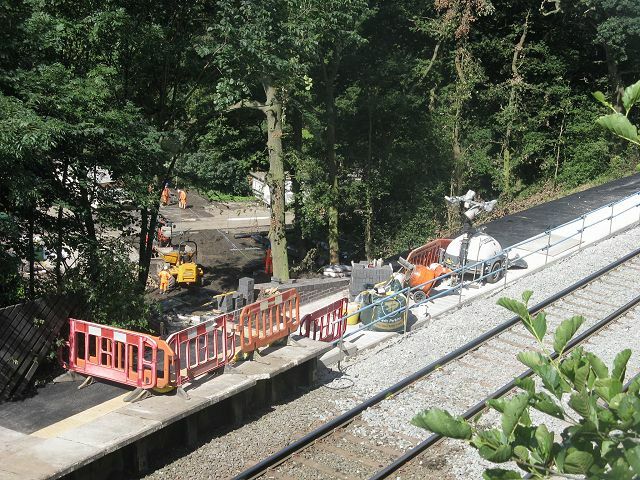 Although trains are now running (at reduced speed) past the site of the landslip at Middlewood, Network Rail contractors are still working, rebuilding the footpath which leads down towards the dwellings at Norbury Hollow and reinstating the land at the caravan site below. We wonder whether there are plans to make this a public footpath as part of the Ladybrook Valley Interest Trail, and remove the very awkward foot-crossing of the line (pictured here) which is the official right-of-way, a short distance down towards Hazel Grove. This would remove the risk of crossing the line, and the effort of climbing the daunting flight of steps. It's hard to imagine anyone complaining about such a change. Perhaps some body could also do some repairs on the rest of the trail, which is sadly neglected. Saturday 23 July: St Andrews Church, Cheadle Road, Cheadle Hulme. Concert by the Robins Singers: summer favourites, with soloists and guest singers. 7.30 pm, Tickets £10. Saturday 30 July: Reinbek care home on Bramhall Lane is holding a 'Fun Day' from 1.30 to 4pm with the usual children's attractions - see the poster in the left column. Incidentally, 'Reinbek' has an interesting history which we have chronicled in one of our local history articles. Saturday 30 July: Flowery Fields Allotments Association are advertising open day from 10.30 to 2pm. Recommended for the refreshments and sales of produce; get there early, we advise. Access via the footpath at the end of Flowery Field. Sunday 31 July: Stockport Railway Station: Annual 'Railshow' from 10.00am to 4.00pm. There will be a special display by the Hazel Grove & District Model Railway Society in celebration of their fiftieth anniversary. 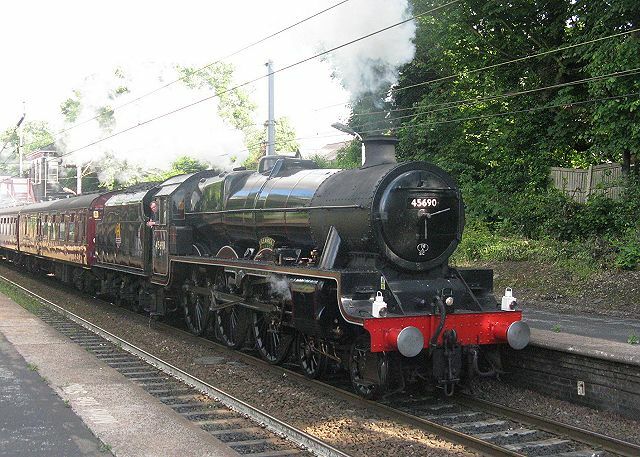 Among the many stalls and societies supporting this years event will be the Manchester Locomotive Society which is celebrating its eightieth anniversary year. Also planned to attend will be a visiting diesel locomotive, stalls, and an open top bus (subject to availability). 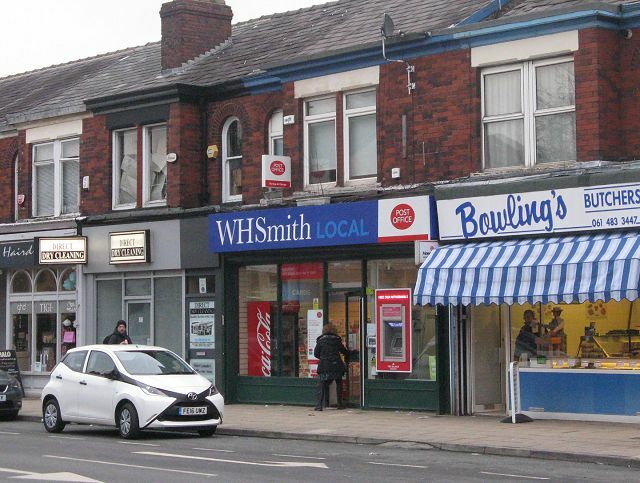 It appears that yet again the 'Garden of Eden' greengrocery on Bramhall Lane has ceased to trade. Let's hope that some further use can be found for this site in the centre of our shopping area soon. After a slightly shaky start due to a faulty train, normal train services are now running to and from Buxton. Why not visit our local Spa town: there's a lot to see and do, and the train journey is rather scenic. A Cheap Day return from Davenport to Buxton, valid all day at weekends, is £9.60, or two can travel together on a 'Duo' ticket for £14.40. If you are aged 60 or over, the £6 'Wayfarer' ticket is the best value for this trip, and indeed many others. You don't need a railcard or bus pass to buy one, although some proof of age might be asked for. Saturdays 25 June saw a steam-powered special pass through Davenport, quite a rare occasion these days. In the picture, 'Jubilee' class loco 45690 Leander accelerates through the station, steam from the chimney and safety valves mingling with the clouds in the sky on the way from Manchester Victoria to Scarborough via Sheffield. There seems to a a craze at the moment for painting preserved locos in British Railways black, which in this case makes it hard to distinguish from the less powerful and more common 'Black 5' type. Not so rare, but quite impressive, is the trainload of limestone which makes its way through our station most weekdays from Tunstead quarries to an unloading terminal at Hope Street, Salford, travelling via Chinley, Stockport and Manchester Victoria. The loaded train passes Davenport at around 11 am, and after unloading it returns by the same route, usually passing Davenport soon after the departure of the 16:05 to Buxton. Like our passenger trains, this train is operated by a subsidiary of the Deutsche Bundesbahn. 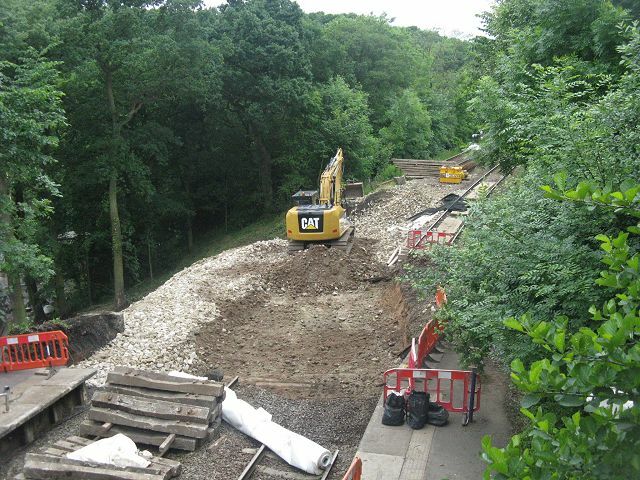 Repairs in progress at Middlewood, 19 June. So we have to pay extra for the pleasure of having to wait half an hour for a train. 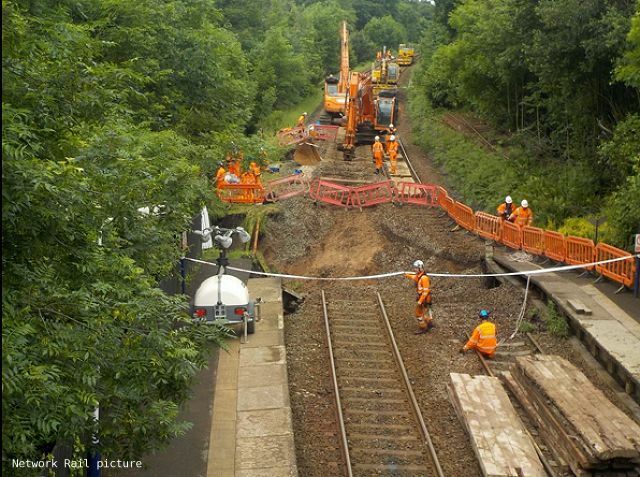 Update 16 June: Northern Railway now say that they do not expect the line through Middlewood to re-open before Saturday 25 June at the earliest. Temporary timetables for weekday and weekend including the bus services are now available. It appears that a drainage culvert passed under the line at this point. As the picture shows, Network Rail are unable to get their heavy equipment across the gap. Flash flooding in the Disley, Middlewood and Hazel Grove areas on the afternoon of 11 June led to problems on both railway and road. A landslip at Middlewood has made the railway impassable, and trains are not running beyond Hazel Grove, with bus replacement now in operation. Times between Davenport and Manchester are as normal, but do check before travelling. 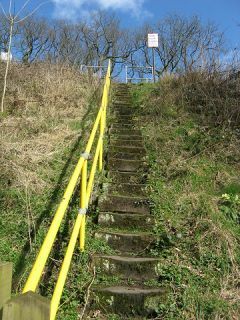 The ground in the Middlewood area is known to be unstable, due to the local geology and the presence of old coal workings and spoil heaps; in 1955 one of the platforms of the former 'upper' station there was carried away, with its waiting room, in a landslip. All trains to/from Manchester will run at (mostly) normal times but turn back at Hazel Grove. On Mondays - Fridays a train service is running between Furness Vale and Buxton. The Brookside Garden Centre in Poynton (including its railway) was also flooded, as a picture on the BBC website shows. Our first electric train for two years: 323 239 calls with the 17:23 (Mon-Fri) Manchester Piccadilly - Hazel Grove on 16 May. This replaces the previous 'Pacer' train and and be the only electric service of the day this summer - better than none we suppose. The new 'Northern still have not branded any trains, although some posters have appeared. Incidentally, although this train no longer continues to Chinley, someone has forgotten to change it in the new version of Timetable leaflet 23 (Manchester to Sheffield) which still shows it going to Chinley. A newly-published book full of essential history is 'A History of Woodsmoor' by Sue Bailey. 101 pages packed with pictures, information and stories about the Woodsmoor area, researched by Sue over the last four years. We heartily recommend a purchase of the book which costs just £10 from Woodsmoor Post Office, Stockport Heritage Trust, Staircase House, or 'Simply Books' in Bramhall. New Timetables apply from 15 May: a PDF of our local booklet can be downloaded from the Northern website. The basic pattern of service remains unchanged, including the absurd lack of a train to Manchester between 08:06 and 08:40. One notable change is that the 17:23 train from Manchester, which has been continuing beyond Hazel Grove to Chinley, will terminate at Hazel Grove. We have heard suggestions that an electric train may appear on this service, which is true will be the first electric train we have seen for some time. As mentioned earlier, last month we prepared a report, which we have sent to Councillor Wendy Wild on the difficulties encountered by pedestrians needing to negotiate the Oakfield Road Garages area on the way to and from the station or village. Download your copy here (PDF 600KB). I discussed the issues you raised and the following is a summary of the actions that I've agreed with officers to progress. Investigate the one way system to determine if anything can be proposed to discourage drivers using the wrong way. Contact UTC to discuss pedestrian crossing timings on the junction of Bramhall Lane and Garners Lane. We await any further developments. All Northern trains are currently running with all the 'Niorthern Rail' logos and web addresses removed. The new rail franchise operated by Arriva (a subsidiary of the German state railway) is operating our trains from 1 April. Their website is at www.northernrailway.co.uk. It's nice that Whaley Bridge has been chosen as an illustration for their List of Stations page. Reminder: trains between Hazel Grove and Buxton are replaced by buses for all four days of the Easter weekend 25 - 28 March while the new bridge over the A555 road is moved into place. The 21:29 and 23:10 Manchester - Buxton trains are also replaced by buses beyond Hazel Grove on 21 - 24 March. Arrivals and Departures from Davenport will be at the usual times, but expect much longer journeys. Elsewhere, and not directly affecting our trains, Manchester Victoria and Salford Crescent stations are closed from Thursday 24 March to Sunday 3 April while Network Rail carries out preparation work for the new 'Ordsall Chord' line. Full details of the many changes to times, and temporary timetables, can be found on the Northern Rail website. It seems that the (slightly unimpressive) image seen here represents the brand logo to be used in future for the train services of what has recently been Northern Rail, the idea being that - as in Scotland - there will be a branding independent of the company operating the franchise. From 1 April, that company will be Arriva Rail North, whose fancy website is now online at www.arrivarailnorth.org. They have followed the lead of Northern Rail in using the .org domain, intended originally for non-profit organisations. The new Arriva North company must be wondering what they are taking on, following yet another major disruption of the service on the morning of 10 March by another 'broken down train' incident, this time near Levenshulme. The 06:49 train from Hazel Grove to Manchester left Stockport on time at 07:00, and appears from the railway database to have finally reached Manchester Piccadilly at 09:45. Many other trains were heavily delayed: one of the passengers affected was Ian McMillan, celebrity poet and railway lover, probably on a train from Sheffield, who took to Twitter in the hope of getting information. As usual, the details of what happened will not be made public. However, we have found out from local contacts what happened on the morning of Friday 4 March (see item below). The 'broken down train' was not a train at all, despite Northern Rail's comment, which is why such a train never appeared on the Network Rail database. It was a road/rail contractor's machine which had been working overnight on preparations for the installation of the new bridge over the A555 at Simpson's Corner. There is no basis for cost cutting on the North’s railways. According to Rail North’s own estimates passenger demand for the north’s railway will soar by 50% over the next fifteen years. Despite this, and the clear need for investment, the Government has stated that annual subsidy will be cut by £160m, or 53% by the final year of the franchise. Furthermore, through Rail North there is now a real opportunity to bring decision making closer to the passengers who use the services because Rail North has responsibility for overseeing and developing the franchises on key issues such as train service levels and what station and train staff will be available to assist passengers and protect their safety. This is despite the German state railway winning the contract to operate the franchise, through a cuts-driven tender process. RMT will continue to argue for a publically owned People’s Railway for the North. The Union believes there will be 'attacks on supervisory and clerical jobs, the introduction of Driver Only Operation and increased casualization arising from the re-franchising processes.' Whether they are right remains to be seen: the idea of 'Driver Only Operation' has been bandied about in Government reports recently. Passengers might well welcome it as it would avoid the irritating waits for the conductor to finish selling a ticket, return to the cab and open the doors, but a lot of work would need to be done on station infrastructure - mirrors, or cameras/screens - to make this feasible. If you are thinking of travelling by train to sample the attractions of Buxton Spa over the Easter weekend, be prepared to travel by replacement bus on any of the four days, as the line beyond Hazel Grove is closed while a bridge is installed to carry the line over the new green-belt-destroying A555 road at Simpson's corner. The allocated running time of the bus between Hazel Grove and Buxton is a wearying 61 minutes (less than 40 minutes by rail), which may prove optimistic given the congestion of the A6 road common on Bank Holiday evenings. To this must be added the 10 minutes allowed for the transfer between train and bus. Dogs and bikes are not carried on the buses, and of course the bus stop for Midlewood is on the main road, reached by a half-mile footpath from the station. The first week of March 2016 turned out to be another troublesome week for passengers on our line. Wednesday 2 March was a traumatic day, with cancellations and delays in the middle of the day followed by 'signalling problems at Hazel Grove' (again) in the afternoon which left Davenport passengers for the 16:08 to Manchester stranded on the station with no information about what was happening, and no train until 17:20. On 3 March the 10:49 Manchester - Buxton was terminated at Stockport due to 'traction equipment problems'. 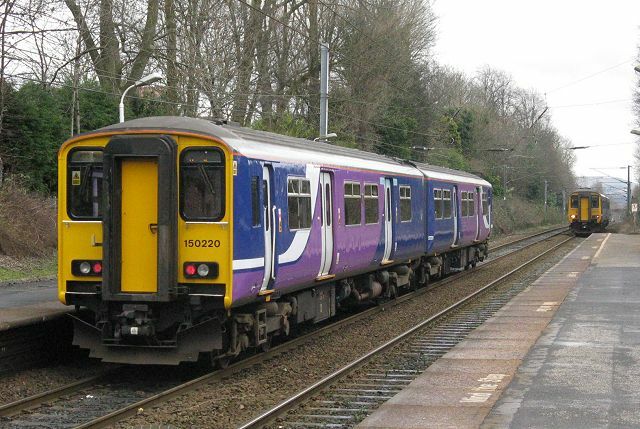 Worst of all, on Friday 4 March, a 'broken-down train' led the a complete abolition of the morning peak service between Hazel Grove and Buxton, with trains turning back at Hazel Grove with ad hoc timings. The first train of the day to leave Buxton was at 10:18. How a single 'broken down train' could lead to this, given that a number of trains spend the night at Buxton ready for the morning peak, and the line is double-track, isn't obvious; we thought it might be snow-related, but Northern Rail's 'Twitterer' denied this. As usual, don't expect details to be made public. Metrolink passengers are allowed free parallel bus routes during disruption, but local rail passengers are expected to pay for the bus trip. Yet both are in the fiefdom of Transport for Greater Manchester. Why is this? What will Arriva do for us? With one month to go before the German State Railway subsidiary 'Arriva North' takes over the running of our trains, the present company seems to be keen to wash its hands of the place already, as orders have gone out to cover up the Northern Rail logo on signs and posters. The new owners have been promising lots of improvements, including scrapping the 4-wheeled 'Pacer' carriages which appear here occasionally, although they have never been allowed to venture beyond Hazel Grove towards Buxton. 98 new trains (some diesel, some electric) to be built by CAF in Spain will be hired, but that doesn't necessarily mean we will see them, as it's likely they will be used on a promised new network of faster trains between main cities, and we'll get the current diesels - refurbished, but will the Class 150 units still have those dreadful 3 + 2 seats that your editor is too wide over shoulders to fit into without intimacy with the adjacent passenger? Probably, since the politicians are obsessed with counting seats, however useless. Of more concern is the frequency of train service which is to be provided. The requirement agreed to by Arriva have now been published online and can be downloaded from this link. The information is quite hard to interpret, especially as it concentrates on the number of trains to/from Manchester in given parts of the day, ignoring any other journeys people might wish to make, such as Davenport to Buxton. The document lists the requirements for December 2017 and December 2019. We'll look here at the table for the Buxton line, December 2017, and the numbers of trains in the Monday - Friday weekday off-peak period between 10:00 and 15:59 - six hours in other words - these are arrival times in Manchester. So it seems we will still have the inadequate half-hourly service we have today. Buxton retains its hourly service as now, but New Mills gets an improved service from one to two per hour, and Hazel Grove jumps from two to four per hour. All these trains must pass through Woodsmoor and Davenport, but which ones will be the 12 that stop here? It's impossible to tell from the information available. However, remarks in the press about faster trains from Buxton might imply a revival of the idea that Buxton trains will be the among ones missing our stops, an idea which was implemented in the 1990s and eventually abandoned after many complaints and has surfaced again recently, condoned by Transport for Greater Manchester officials - who one might think would favour their own stations over those in Derbyshire. 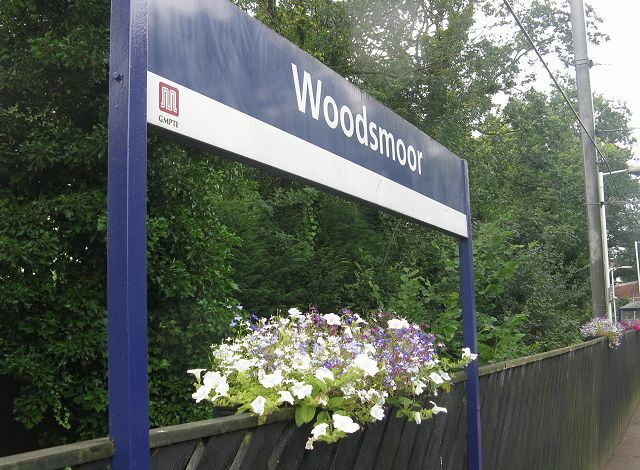 One of the benefits of living here is the easy access by train to the Peak District, and of course Davenport and Woodsmoor stations are used by pupils from the High Peak attending local schools. One of the reasons for opening Woodsmoor station was access to Stepping Hill Hospital for High Peak residents. We are trying to get the facts, but it's hard to know who to ask. The speed limit for all trains on the Hazel Grove - Edgeley section is just 40mph, with 25mph round the curve into Stockport, and the trains which run non-stop over that section at present do not gain significant time over those that stop, so why deprive us of a useful service? In the past, Davenport has had three, and sometimes four, trains per hour each way. 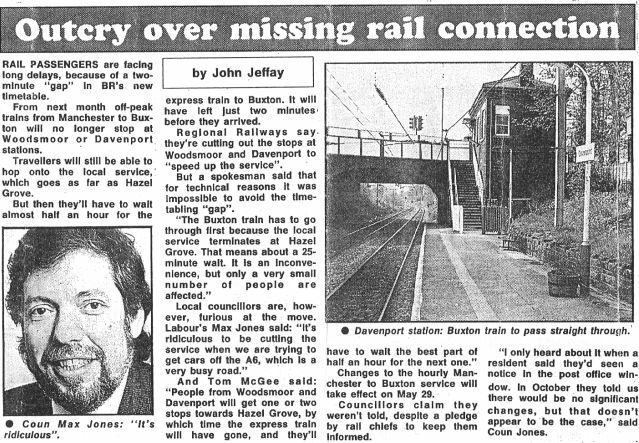 Davenport was once busier than Hazel Grove, but the opening of Woodsmoor in the early 90s has divided the figures, as many passengers previously walked from Woodsmoor to Davenport to catch their trains. Hazel Grove station has also benefited from people who drive there to take advantage of the car park and Greater Manchester's cheaper rail fares. New Mills Newtown does not now have a crossover between tracks, nor any signals, so any train terminating there will need to continue to Furness Vale before returning. However, as things stand the crossover there, north of the station, is not equipped with the safety devices for trains containing passengers, so trains will have to return empty to New Mills to pick up. Perhaps there will improvements made to the signalling arrangements before December 2017; the extra New Mills train is going to need some smart working to avoid delays, which may be why it apparently doesn't call at Disley. Why Woodsmoor seems have bucked the trend is a mystery: it's probably due to changes in the way the statistics are compiled, or maybe since the fares are the same, conductors have not changed their machine settings. A fall in usage might well have been expected since the restrictions in off-peak fares which came into effect in September 2014, but who knows? Our station certainly isn't the quiet backwater that some officials seem to imagine. A press cutting from 24 April 1994. Guess who placed and paid for the notice in the Post Office window? 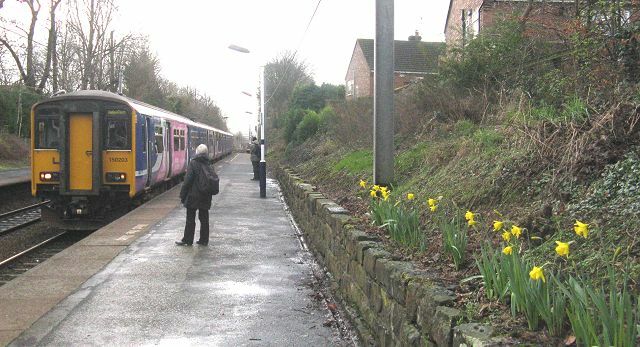 The first week of February saw our early daffodils open, but in other ways it was a troubled week for the local rail network. 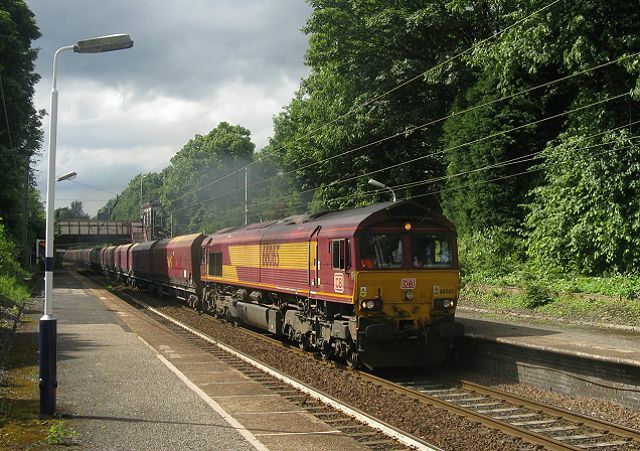 On Wednesday, the locomotive of a DB Schenker freight train from Trafford Park to London gateway gave up the ghost while passing through Oxford Road station, blocking the junction at Castlefield used by our Hazel Grove - Blackpool trains for over an hour until a loco from the Freightliner company was commandeered to drag the train out of the way. Worse was to come the following day - around 08:30 all the signalling in the Hazel Grove area suffered a major power failure, with the result that no trains at all ran through Davenport for several hours. Noticeably (above) even the signal light at the signal by Davenport car park, which is actually controlled by Edgeley Junction signalbox, was showing no light at all. None of these problems are under the control of our train company Northern Rail, but it would be good to see some explanation or apology online. Replacement buses were supposedly provided, but of course why would a Davenport passenger wait for one rather than catch an ordinary bus to Stockport even if buying a ticket is needed. When there are problems on Metrolink, arrangements are quickly made to accept their tickets on buses, so why cannot the same apply to trains within Transport for Greater Manchester's area? Elsewhere, the damage due to storms was still having its effect on the main line network through the week, with the Carlisle - Glasgow, Newcastle - Carlisle, and Settle - Carlisle main lines all closed for emergency repairs. 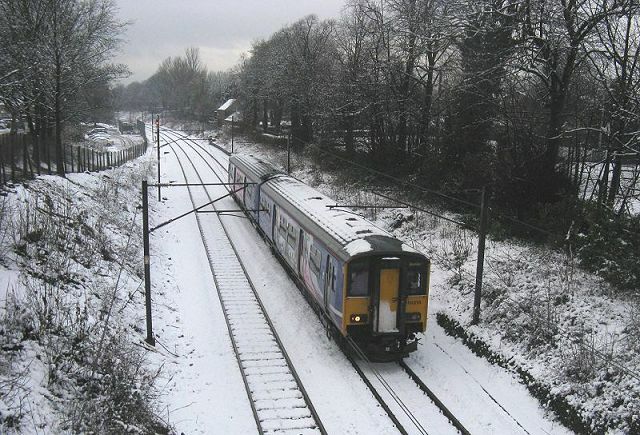 We have been informed that the closure for engineering work of the Hazel Grove - Stockport line planned for Sunday 24 January has been cancelled, and trains will now run as normal, except that the 09:04 train to Manchester is replaced by a bus at 08:59 to Stockport for onward connections. However, there will still be replacement buses running between Stockport and Alderley Edge (calling at Wilmslow) and Stockport and Stoke-on Trent. Trains between Manchester and London, South Wales and the South-West will be running via the Styal line, calling at Wilmslow, Crewe and also - in some cases - at Stoke-on Trent. The changes to train schedules (below) on Saturday 23 January still apply: the line between Manchester Oxford Road and Bolton is closed and replacement buses for that section will run all weekend. Check your journeys carefully on the National Rail website. Although not as well publicised as they might have been, there are some changes to Davenport's train services for the weekends of 9/10, 16/17 and 23/24 January. Those Saturday trains which normally run beyond Manchester Oxford Road station are terminating at, or starting from, Manchester Oxford Road, running in the normal timings. As usual, the new year sees an increase in train fares. 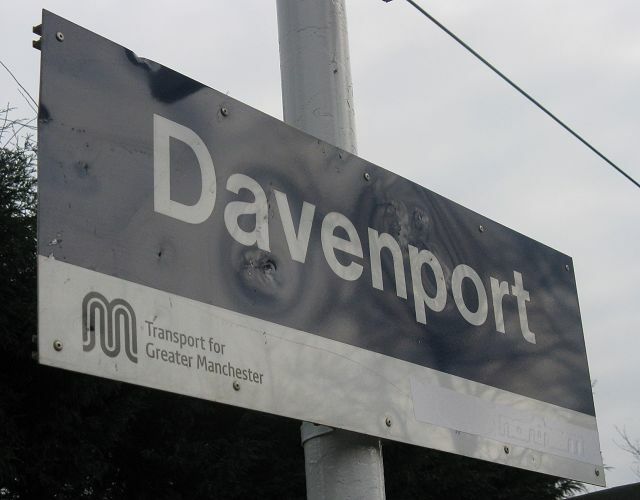 Day return fares to Manchester Central Zone from Davenport are now £3.50 'off-peak' and £5.90 'peak'. The 'Peak' fare (which has not increased) applies to any journey, out or return, starting on Mondays - Fridays before 09:30, and/or between 16:01 and 18:30. (At weekends 'off-peak' fares apply all day.) Remember that these times apply in both directions, so although the 16:08 to Manchester may appear not to be full of commuters, it is still a 'peak' train. The last train in the afternoon from Piccadilly before the 'peak' is the 15:49, the first train after the 'peak is the 18:49.